Are you in need of a wedding gown in a hurry or just looking to save some money on your bridal dress? For one day only, anna bé will bring brides the biggest sample sale around! There will be loads of wedding dresses from a range of bridal designers and styles that will be 30%-75% OFF! To make sure that the shopping experience is still fun and stress-free, we do require appointments. Please call 720-855-1111 to schedule your sample sale appointment today and save on your wedding dress! THURSDAY, MARCH 21ST: Appointments are required! Call 720-855-1111 to schedule yours! Get booked! There is only one of each dress so you want to be the first to find, fall in love with, & take the dress that has your name on it the very same day. Generally, sample sizes work best for brides who wear between a 6-10 in ready-to-wear clothing, but keep in mind that you will still need alterations. The dresses in the sale have been tried on & are sold as-is which makes the prices unbeatable. Bring your best babe who is supportive, excited for you, & can help you be your most decisive self. Max of 2 guests for the sample sale extravaganza. Get ready to find your dress & take her home the same day! 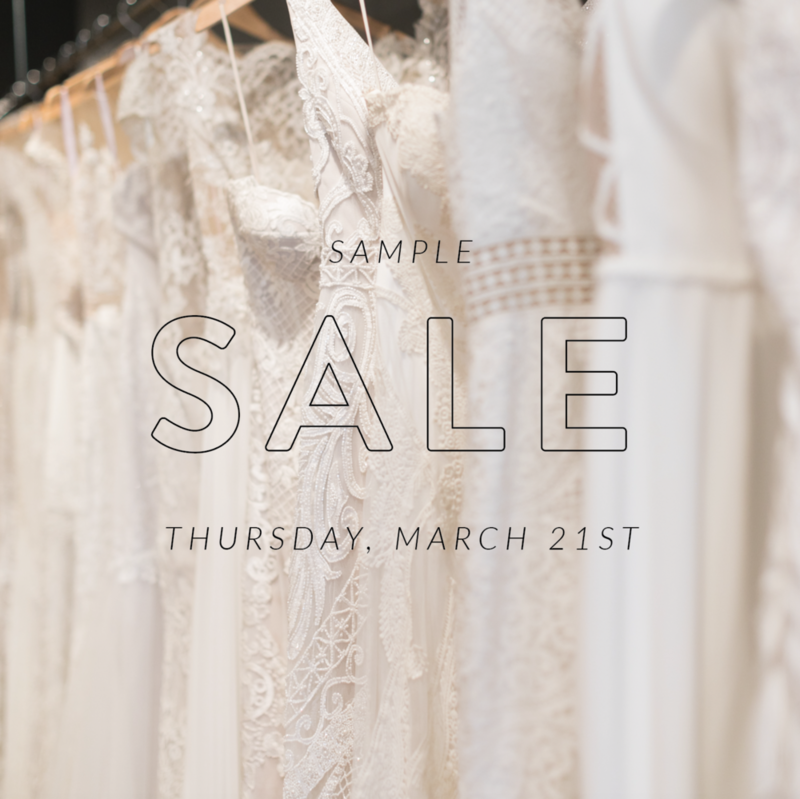 Navigating a sample sale can be tricky business but we have scores of brides who have gotten their dream gown for a serious discount at one of our sample sales. • are you able to make a decision quickly or do you need lots of opinions and/or mom's approval before making your final choice? • are you a street size 6-10 and average height? • is there one particular dress that you absolutely have to try on or have? And please know, for this one-day sale we are going to be extremely generous with our pricing so you can spend more time shopping and no time haggling. Happy dress finding! Let's do this.